When you lose people you love, and we all do, most of us look for the pieces of them we have left. Photos, letters, recordings, the little things they loved. I have a few things of my husband’s and my son’s tucked away in a drawer by my bed. There are little things from my mother, father, grandparents around the house. Most of the time, the things are just there, but a lot of times seeing them warms my heart. They keep those loved ones close to me. That’s not to say I don’t have some of the same kinds of things around from family and friends who are still with me. I like to surround myself with pieces of my life. One of the nicest things that happens is when you find a piece of the past unexpectedly. Once I found a piece of paper that was the last grocery list my husband wrote. I keep it tucked in my billfold. I guess it will wear out eventually, but it’s nice to know it’s there. I’ve got a trunk in my bedroom full of little treasures from my kids. The trunk belonged to my great-grandmother and was painted and decorated by my mother-in-law for a wedding present. I look in there every once in awhile and it’s like a bombardment of memories. I tell people that one of the best things you can do for someone who loses a loved one is to share an old photo or memory of them. It’s like filling in a piece of the person they were. I found a box of slides in the bottom of a box last week. They were dated 1979. I must have taken them but don’t remember taking any slides. Maybe I put the wrong film in my camera or was just trying something new. I’m not sure I’d ever seen these pictures before. I realized they were from my son’s 4th birthday and took them to have prints made. We never knew what we were going to end up with in those days so some photos aren’t very good, some are almost too dark to see. There are a couple of my mother holding her youngest grandson, a month old at the time. I lightened them on the computer and they brought back her tenderness as she held that baby close to her. There’s another one, also very dark, of my sister holding her youngest, that same month old baby. So long ago, yet so close in my heart. 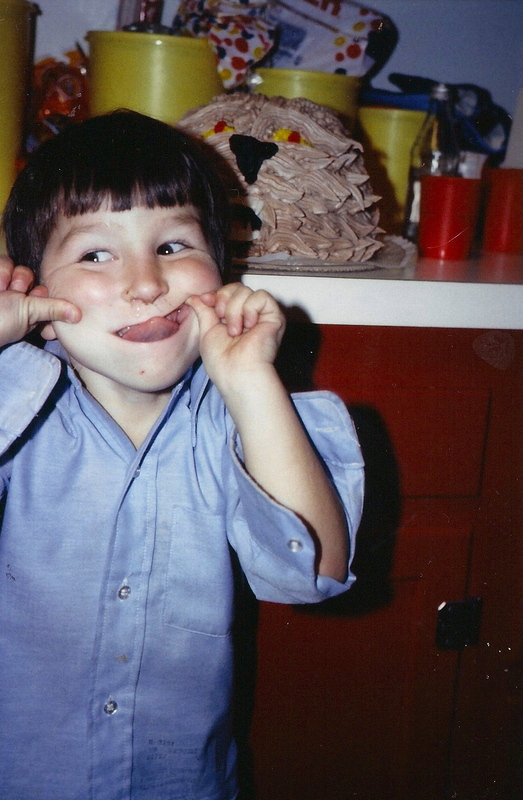 There are photos of my son that turn up from his friends now and then. They are good about posting them on his Facebook page, which we keep open. It’s good to see him alive and laughing. It fills in pieces of how he was when I wasn’t around. I keep a lot of things written about him and by him in a box for his daughter to have later when she wants to get to know him. This holiday season, we all might think about finding some of the pieces for other people, reminders of loved ones. Yesterday, I got this picture of my son, seeing it for the first time, from a long ago slide. His daughter, the greatest gift he left us, just turned 4 and here he is at the same age. It makes me laugh and cry at the same time to see my little snotty nosed, goofy kid with his Wookie cake on his 4th birthday. It’s a piece of him recovered for my heart. Nice post, Karen. Merry Christmas from Christmas Cove, Saint James Island, USVI. Thanks, Jenny! Have a very Merry Christmas!